We’re on a nice little roll here over the past few posts – hope you’ve been able to benefit in some way. One quick side note: we’ve switched email providers as a result of some sending issues we’ve been experiencing. If you didn’t get an email today and you’re on our list then please check your spam and add us to your whitelist. If you didn’t get it then please email list@nhltips.ca and we’ll take a look. 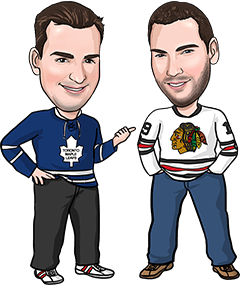 If you’re new here and want to get emails when we post please send a message to list@nhltips.ca with your preferred email and we’ll get you set up. Alright, there are 8 games on Tuesday’s slate. We detail our favourite play below as well as offer an opinion on a few other games tonight. Our fade of the Predators Saturday night couldn’t have cashed in easier fashion, as the Hurricanes went into Nashville and never trailed in a 5-3 victory (hopefully you had a piece of the suggested +141 Canes moneyline there, even though our official play was on Carolina +0.5 -127). With the Predators -157 road favourites tonight in Anaheim, the door is open for us to apply a lot of the same logic here. Nashville’s loss to Carolina Saturday was the seventh straight game that the Preds have failed to win in regulation time (they’re 3-4 during that stretch, but all three wins came in OT), and you’d now be 24-12 taking +0.5 against Nashville over the Predators’ last 36 games. That’s not a small sample size, that’s nearly half a season. And the road is where the Predators have been especially vulnerable, winning just seven of their last 27 games in regulation time. It’s obviously a lost season in Anaheim, but at least the Ducks are still showing some signs of fight. Over their last five games, they’ve won three of them (including an 8-2 blowout of the Habs) and were a couple of minutes away from cashing as +161 dogs at home to St. Louis. We can also expect Anaheim’s veteran players to get up for this matchup with the rival Predators, who knocked them out of the playoffs a couple of years ago. Finally, Anaheim’s been a tougher out in its own barn this season, earning a point in at least 22 of its 35 home dates. At close to even money, we’ll ask them to make it 23 of 36 against a Predators team that is a mere 17-16-3 since December 15. Both of these teams are dialling things up defensively as they push for playoff positioning. Washington’s allowed just 9 goals in its last 6 games as part of a 7-game winning streak, and the Penguins have limited eight straight opponents to three goals or less in regulation time (excluding empty netters). Our suggestion on the Blue Jackets Team Total Under 3.5 Saturday against Pittsburgh looked good late in the third period with Columbus clinging to a 2-1 lead, only to see the Jackets score twice in the dying minutes (including an empty netter) for a deceptive 4-1 final score. These games are always intense given the hatred between the two franchises, and their last two meetings finished with 2-1 scores — making the Under 10-4 in the last 14 clashes. Capitals/Penguins Under 6.5 +121 looks like the way to play this one. There’s something about seeing the winged wheel that gets the Habs’ offense firing. They’ve scored at least 4 goals in 6 of the last 7 meetings, including an 8-1 rout of Detroit a couple weeks ago in Motown. And if you think the Red Wings bring extra defensive intensity tonight to avenge that lopsided defeat, they haven’t done that following 7-3 and 10-1 beatdowns they’ve suffered at the hands of the Canadiens over the last couple of years. Detroit hasn’t won in regulation since Valentine’s Day, is 1-9 in its last 10 trips to Montreal, and the Canadiens tend to come out strong in their first home game following lengthy road trips. Canadiens Team Total Over 3.5 -109 and Red Wings/Canadiens Over 5.5 -123 are both plays that probably make our personal cut tonight. The Blues have cooled off a bit since their 11-game winning streak was snapped with a 5-2 loss in Dallas February 21. Including that defeat, St. Louis has scored more than two goals in a game just twice in nine outings, and those offensive breakouts came against the lowly Ducks and Kings. Arizona got lit up for 7 goals last night in Chicago, but prior to that, the Yotes had allowed just 16 goals in their previous 9 games, going 8-1 during that stretch. We expect Arizona to tighten things back up tonight. Unfortunately, so too do the oddsmakers, putting -124 juice on the Under 5.5 and pricing the Blues Team Total Under 3.5 at -137. There’s not much value in either line, so we’ll just sit this one out.